Survivor: Vanuatu (2004) - 2nd place, two jury votes. Received two jury votes, to finish in 2nd place (5-2) in Episode 14, "Spirits and the Final Four" (Day 39). Vanuatu Ep. 1 RC/IC: "Fire Starter" - Yasur performs well out of the gate (thanks mostly to Chris); Yasur wins. Vanuatu Ep. 2 RC: "By the Numbers" - All the Yasurs manage to cross the bar, Yasur wins. Vanuatu Ep. 2 IC: "Four on the Floor" - Tethered to Ami & Leann; Scout forgets one of the water pieces, Yasur loses. Vanuatu Ep. 3 RC: "Great Escape Run" - Participates, but Yasur loses on the reward portion. Vanuatu Ep. 4 RC: "Remembrance" - Does not make a match, Yasur wins anyway (Dah!). Vanuatu Ep. 4 IC: "Tribal Tiles" - Moves tiles for Yasur, and Yasur wins again. Vanuatu Ep. 5 RC: "Dive Masters" - Now with New Lopevi, which is all-powerful. Lopevi wins. Vanuatu Ep. 5 IC: "Outwit, Outplay, Outrig" - Helps retrieve the frame, new Lopevi wins again. Vanuatu Ep. 6 RC: "Pig Pen" - Catches pigs, Lopevi wins again. Vanuatu Ep. 6 IC: "Strung Out" - Works the puzzle portion with Chad, another New Lopevi win. Vanuatu Ep. 7 IC: "Shoot Your Way Home" - Shoots a slingshot at plates, Lopevi loses (narrowly) again. Vanuatu Ep. 8 RC: "Fire Fighter" - New Lopevi saves one last win for the final tribal challenge. Vanuatu Ep. 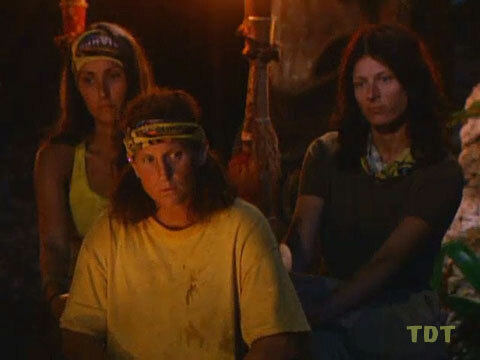 10 RC: "Sacrificial Lamb" - Part of the losing team, with Julie, Scout, and Leann. Vanuatu Ep. 8 IC: "Jumper" - With Chad, 3rd/4th in her first-round heat, but ahead of Scout (bottom 5/10). Vanuatu Ep. 9 RC: "Head Hunter" - Eighth person eliminated, lasts until the final question (2nd/9). Vanuatu Ep. 9 IC: "Memory Mosaic" - With Scout, eliminated in the second round (tie-5th/9). Vanuatu Ep. 10 IC: "Get A Grip" - No elapsed time shown, but outlasts everyone else, and Twila wins! (1st/8). Vanuatu Ep. 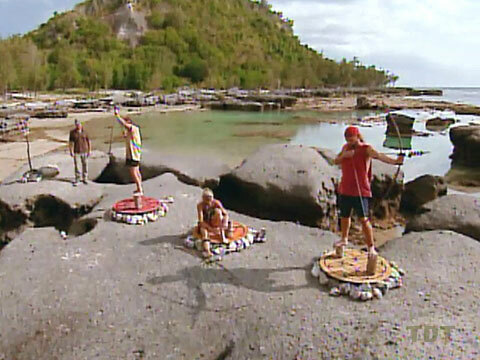 11 RC: "Played Out" - with Chris, one of the first people eliminated, got three right (tie-6th/7). Vanuatu Ep. 11 IC: "Love Is Blind" (with loved ones) - with her son, James, fifth to reach the puzzle stage (5th/7). Vanuatu Ep. 12 RC: "Bridge Over Troubled Water" - Not close to the top three (5th/6). Vanuatu Ep. 12 IC: "Island Hopping" - does not win at shuffleboard. Vanuatu Ep. 13 RC: "Redemption" - eliminated in the first round (2nd/5). Vanuatu Ep. 13 IC: "Warrior" - does not win. Vanuatu Ep. 14 F4 IC: "Snakes and Ladders" - second to retrieve her puzzle pieces, does not win (2nd/4). Vanuatu Ep. 14 F3 IC: "Ready, Aim, Don't Fire" - second to drop out (2nd/3). Vanuatu, Ep. 2: Dolly Neely (voted out, 5-4). Vanuatu, Ep. 3: Mia Galeotalanza (voted out, 5-3). Vanuatu, Ep. 8: Rory Freeman (voted out, 6-4). Vanuatu, Ep. 9: 'Sarge' Masters (voted out, 7-1-1). Vanuatu, Ep. 10: Chad Crittenden (voted out, 6-2). Vanuatu, Ep. 11: Leann Slaby (voted out, 4-3). Vanuatu, Ep. 12: Ami Cusack (voted out, 4-2). Vanuatu, Ep. 13: Julie Berry (voted out, 3-2). Vanuatu, Ep. 14 (F4 vote): Eliza Orlins (voted out, 3-1). Vanuatu, Ep. 3: Three votes, from Eliza, Julie, and Mia. Vanuatu, Ep. 13: Two votes, from Eliza and Julie. Vanuatu, Ep. 14 (F4 vote): One vote, from Eliza. Vanuatu, Ep. 14: Received two jury votes, from Ami Cusack and Scout Cloud Lee, but lost (5-2). Go! All of you! Go! Pre-challenge lineup, Ep12 RC. With car, for cursing purposes. Chris won immunity, huh? Well, that won't happen again. SurvivorOz podcast (7/17/12): "Twila Tanner Interview"
"Twila Tanner was born in Osceola, Iowa, where she lived for 11 years. She eventually moved to Missouri, where she attended Marshall High School. She currently works full time for the Missouri Department of Transportation doing highway repair. She also works part-time as a custodian for Marshall Public Schools and on the weekends for Brown Construction of Gilliam, Missouri, running heavy equipment. Tanner currently resides in Marshall, Missouri. Her birth date is October 12, 1962."